Noah's Park and Playgrounds, LLC, warrants all installation labor for a period of one year, from the completion date of the installation. Our warranty applies to full installations only. 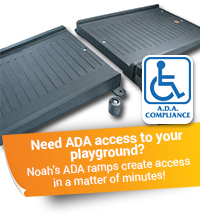 Noah's Park and Playgrounds, LLC, will only choose companies who stand behind their products and offer our clients product warranties on all their products and manufacturing processes. If you have an item you believe may be covered under warranty give us a call and we'll help you make the determination if the product is still under warranty. To expedite warranty issues, manufacturers will typically require photos of the item in question. Photos simply assist our manufacturers in their determinations about warranty replacement issues. Before you call, we suggest having clear, up-close photos ready to email to us in a common format such as a .jpg or png. You are welcome to call Noah's toll free number 1-877-248-5444 or email your question and photos to info@noahsplay.com. We will do our best to get your park or playground equipment back in working order as quickly as possible.